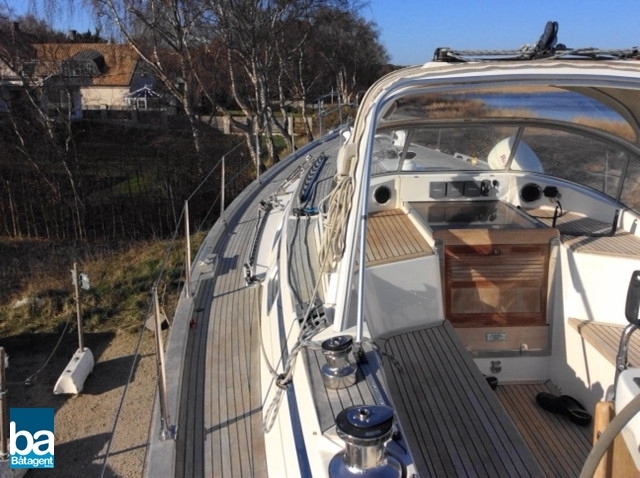 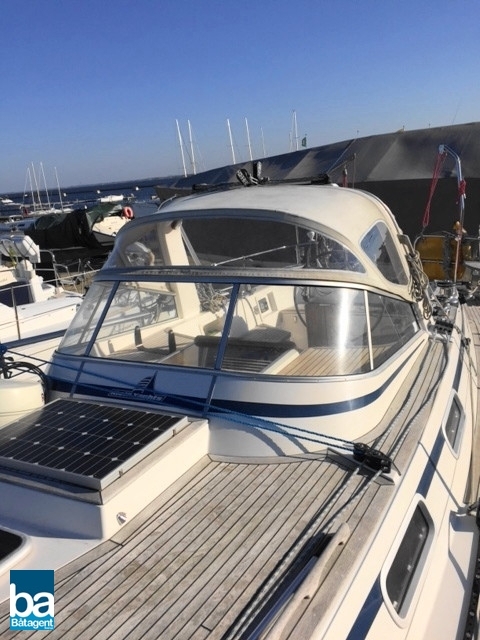 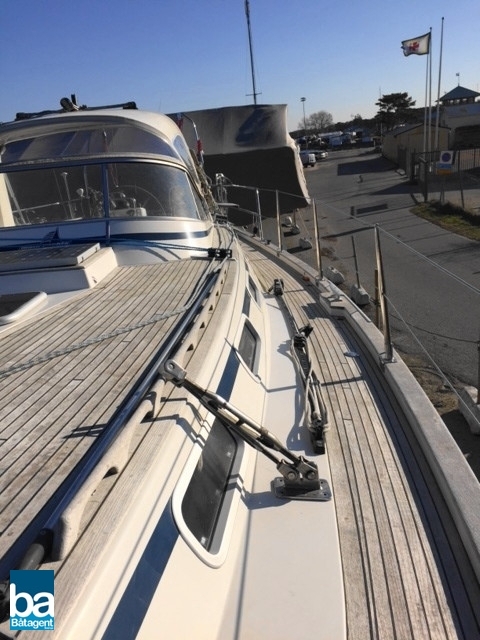 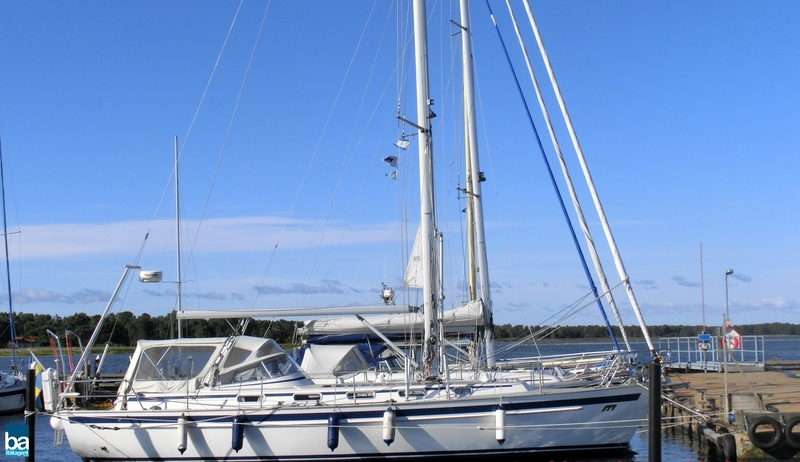 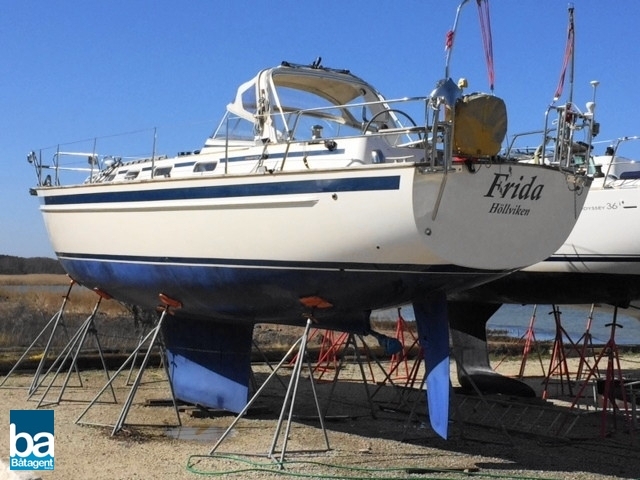 Mal� 40 Classic is a large 40-footer of the absolute highest quality which we have cpome to expect from yards on the Swedish island of Orust. 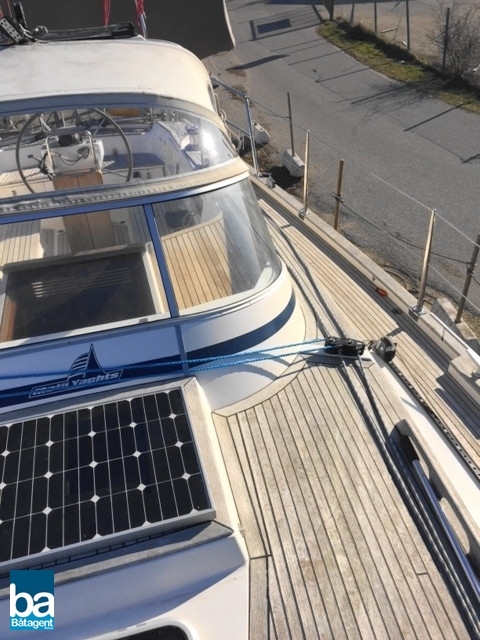 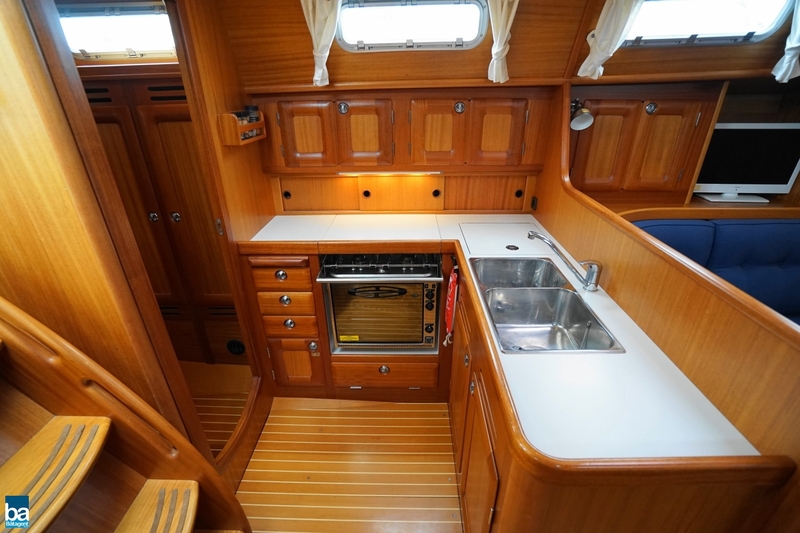 This example is a beautiful three-cabin version ready for anything you can dream up. 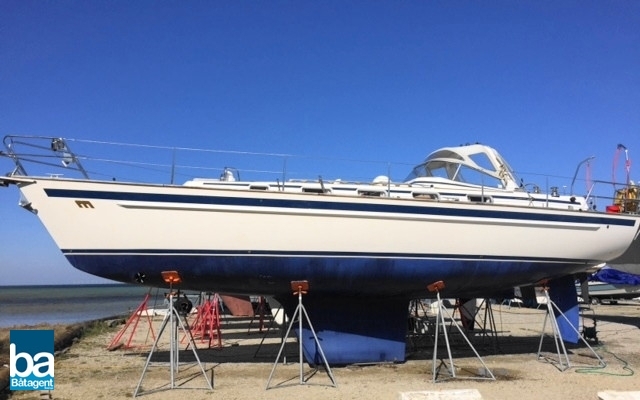 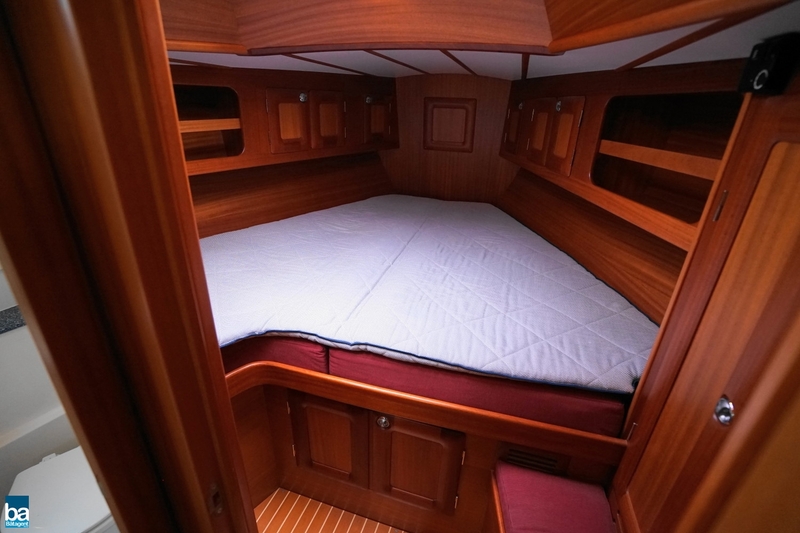 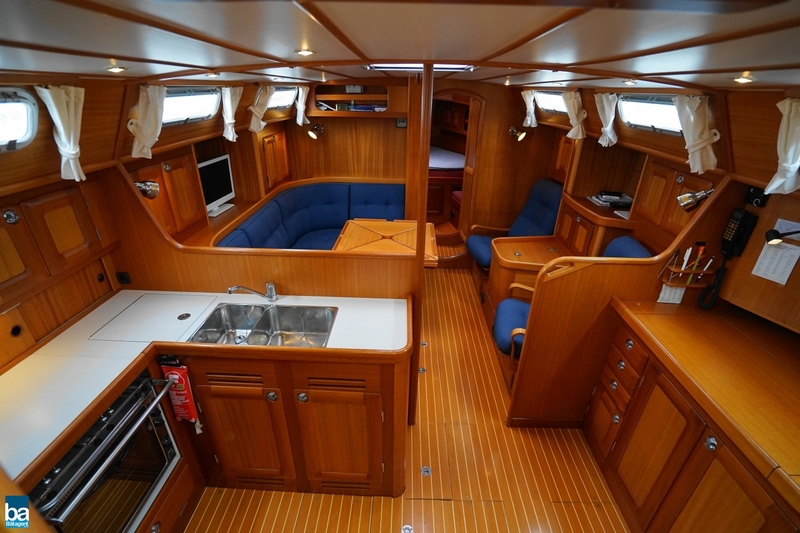 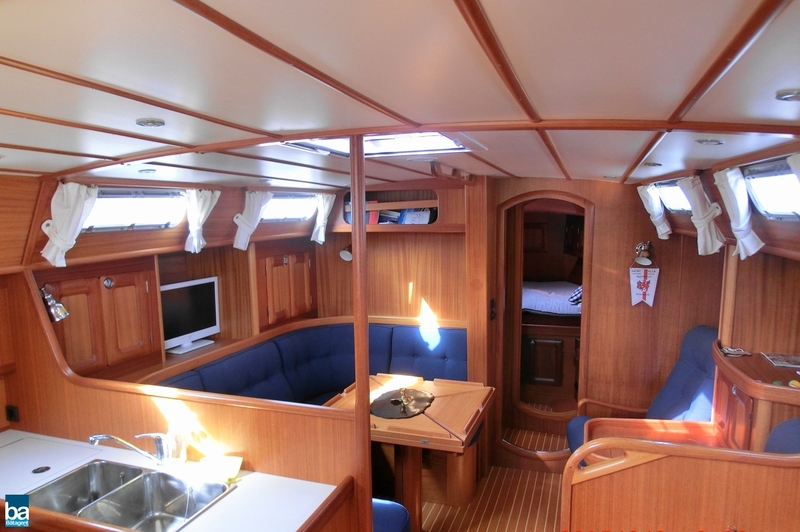 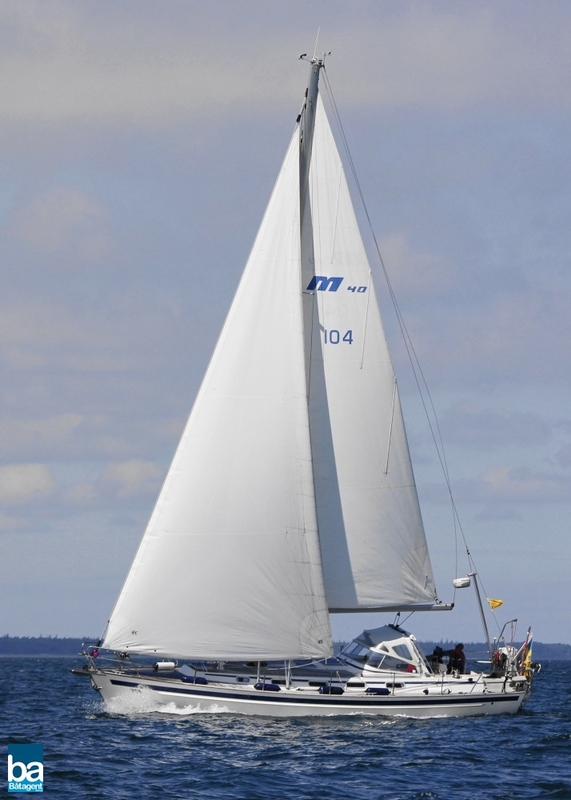 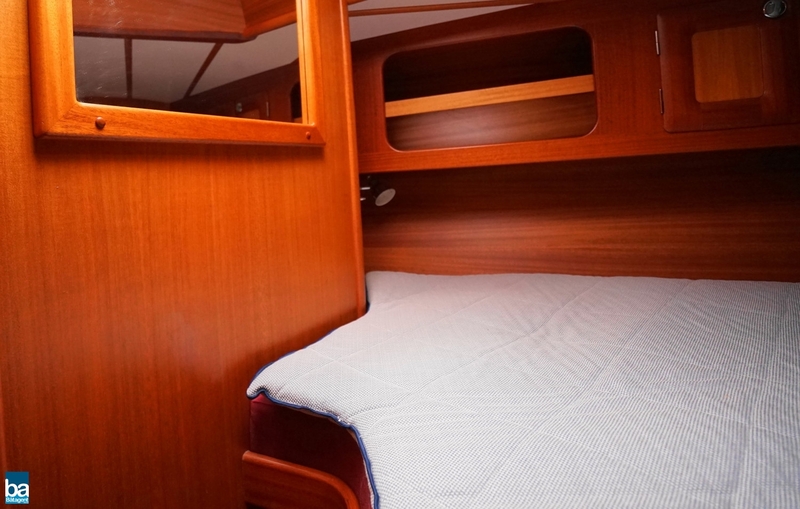 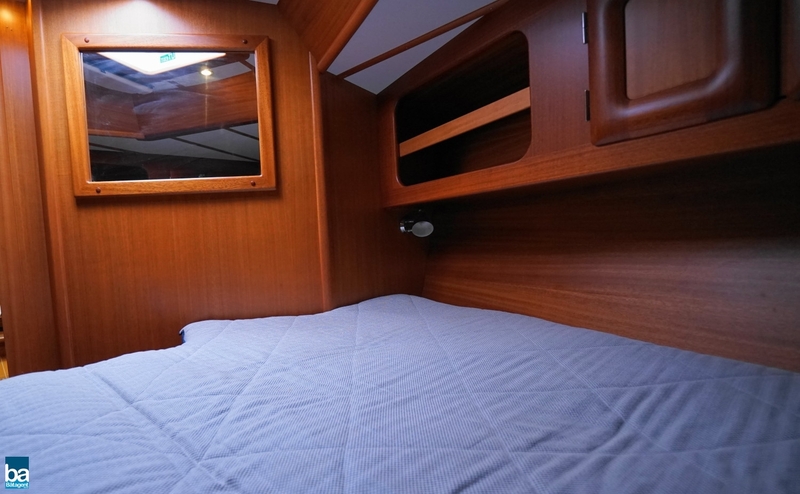 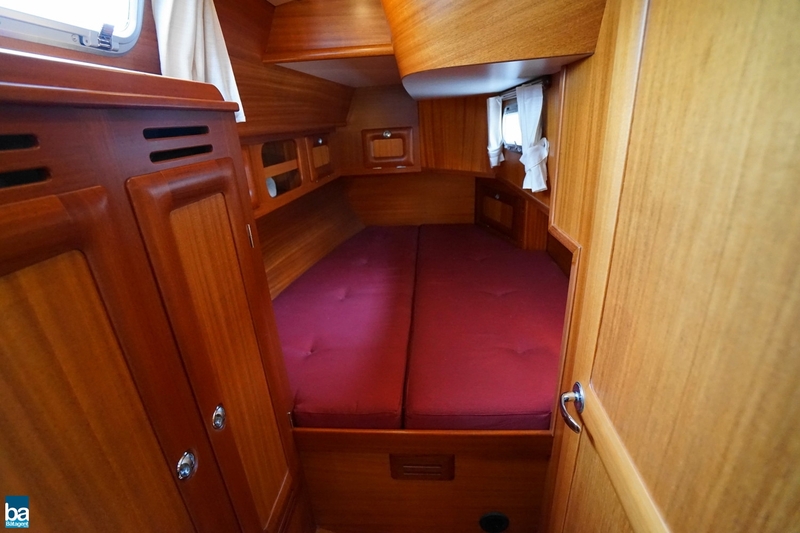 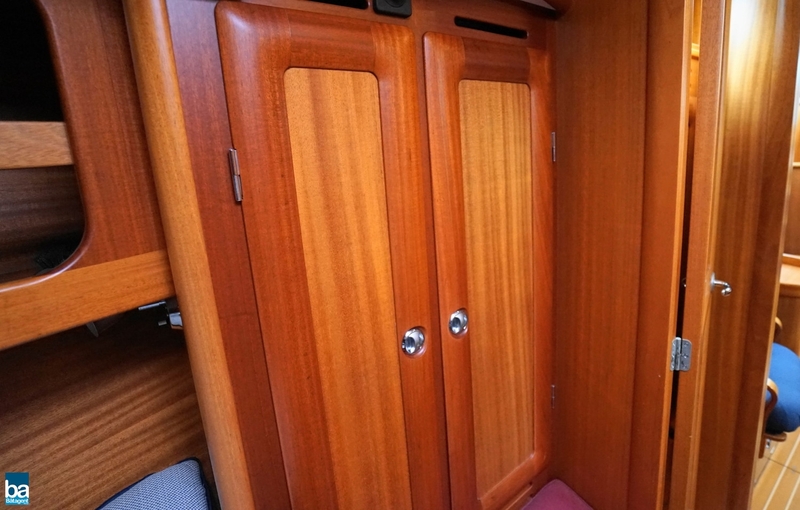 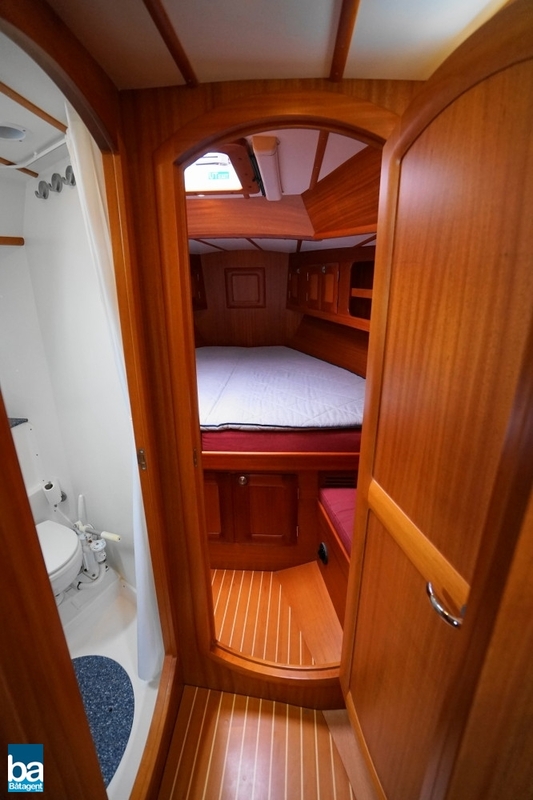 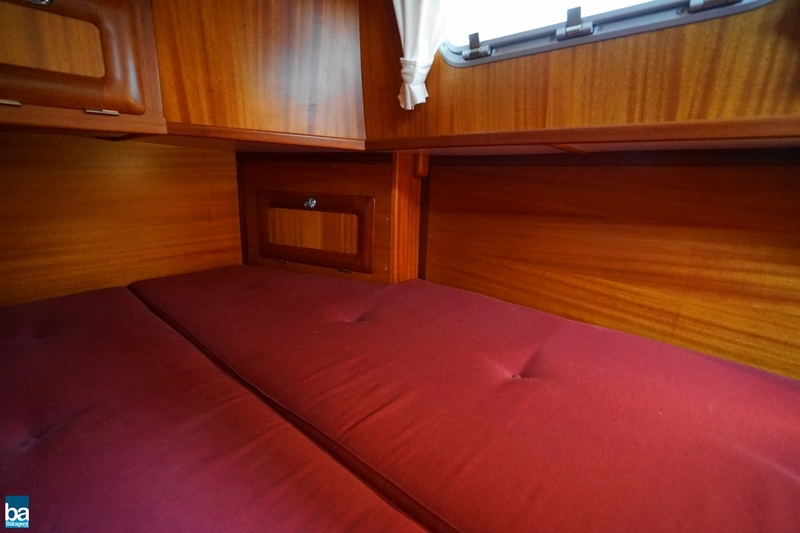 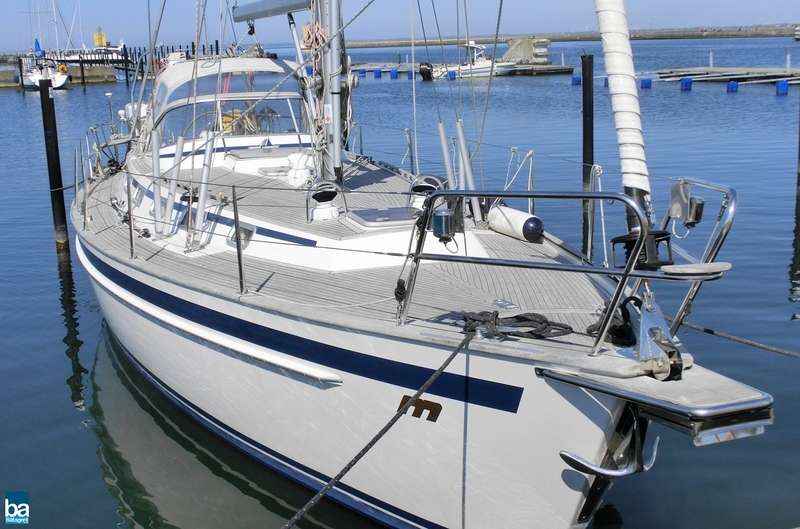 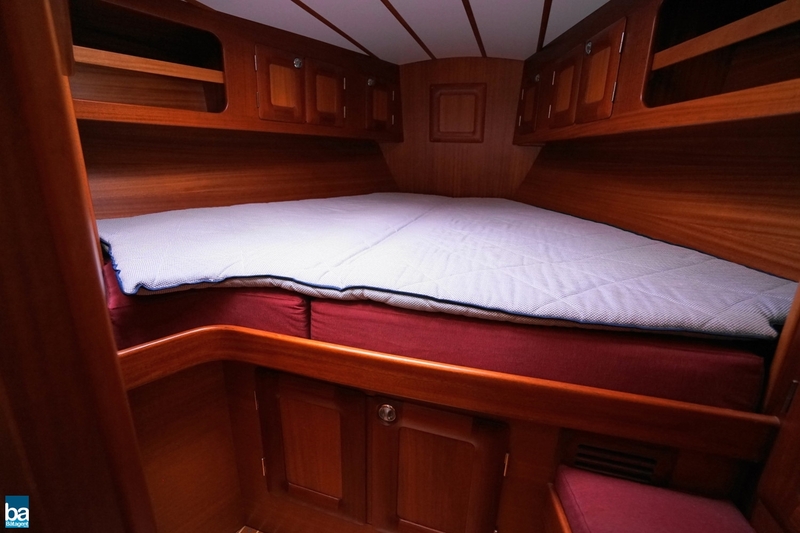 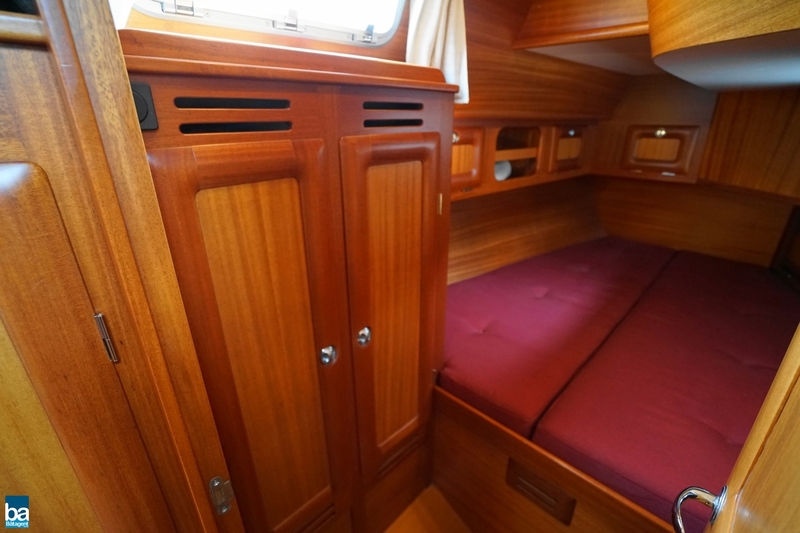 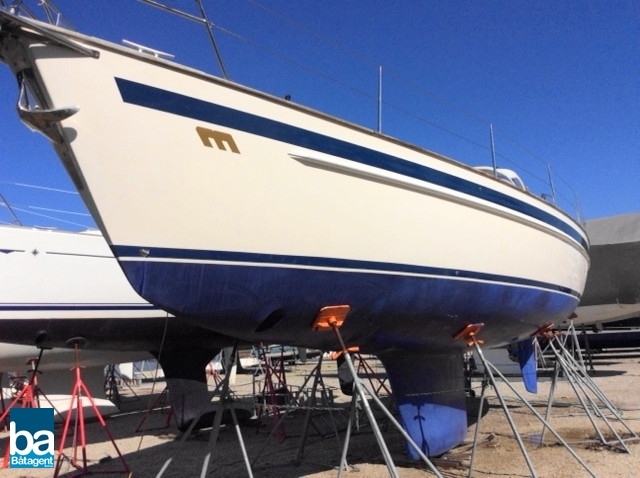 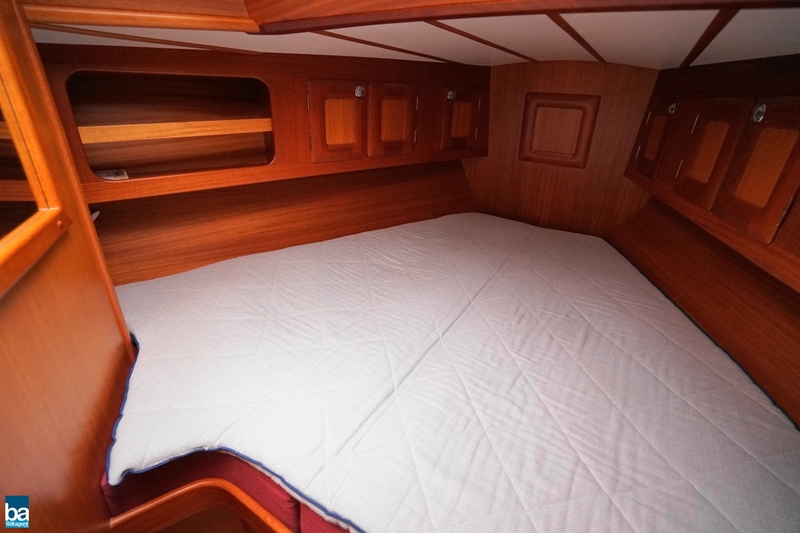 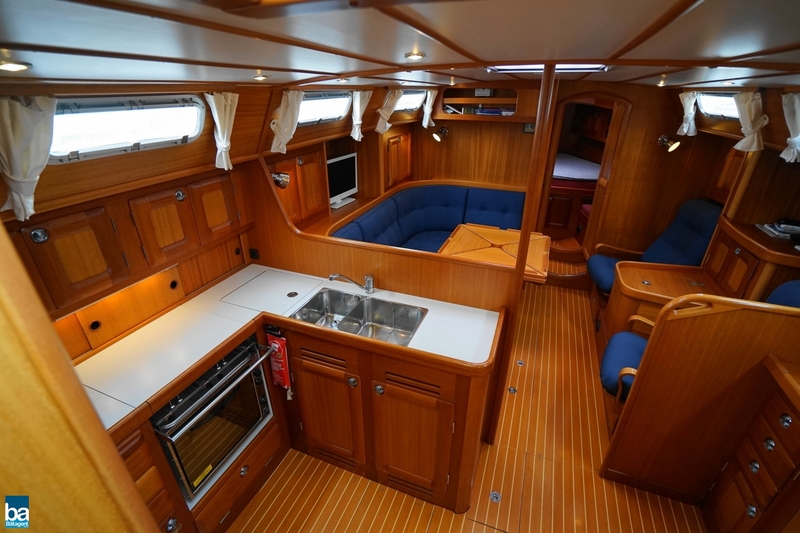 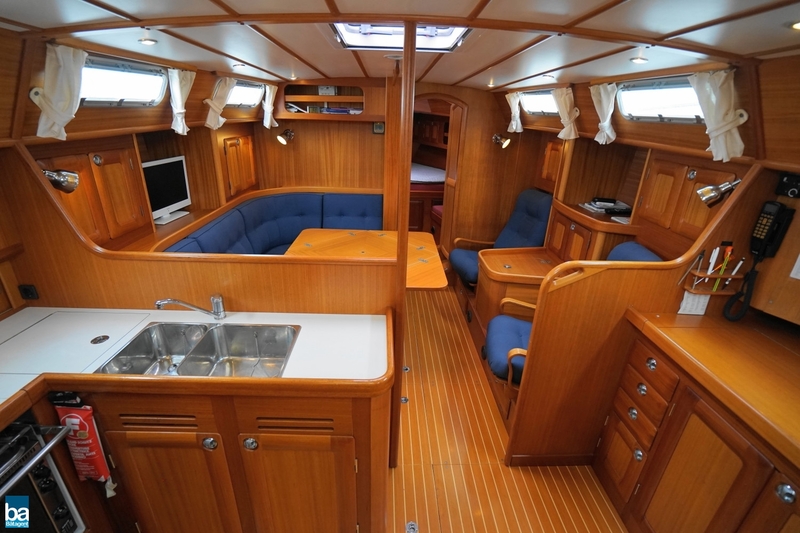 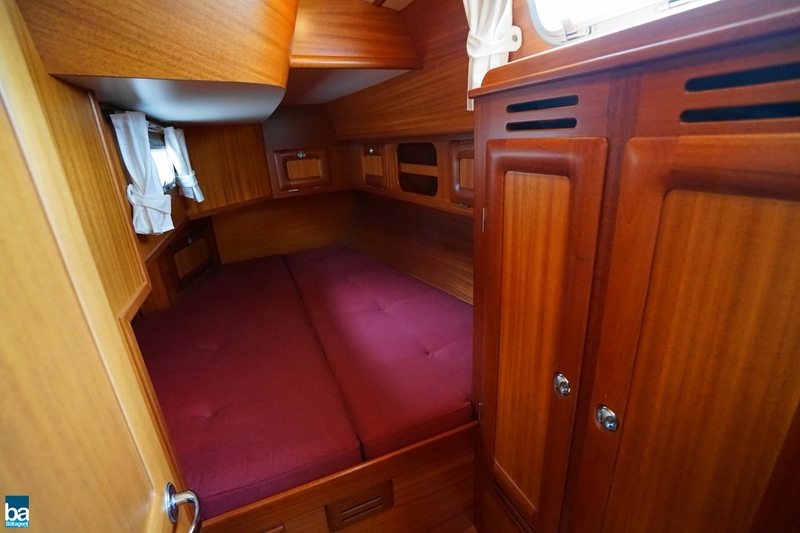 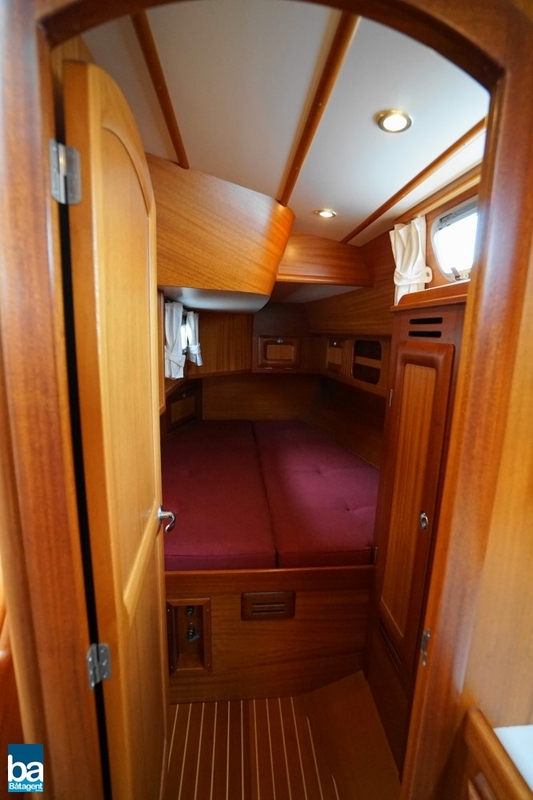 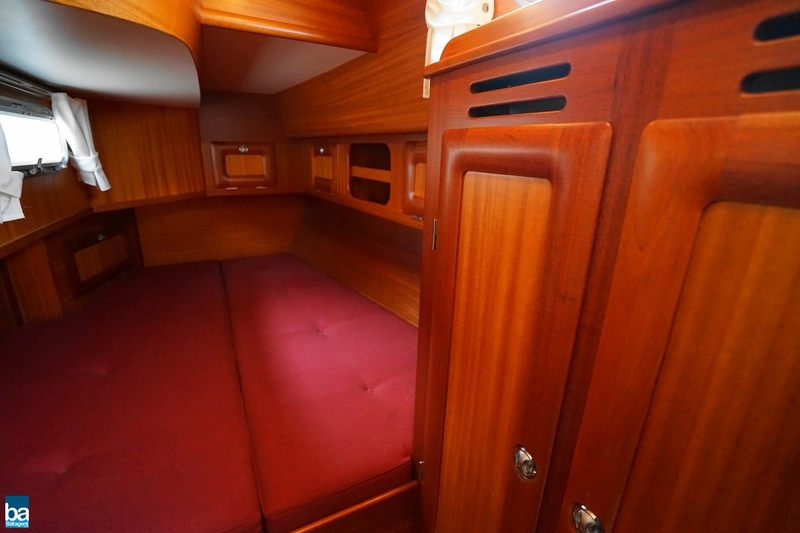 Malö 40 Classic is a large 40-foot Orust boat of the absolute highest quality. 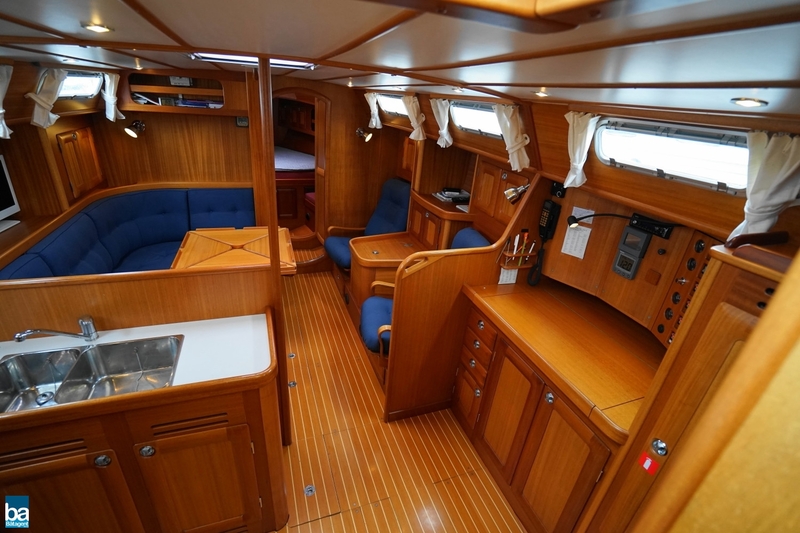 In Malö's typically modest way of naming their yachts, the Malö 40 Classic is actually 41.5 ft. With the tradional stern, incorporating a larger aft deck, this also adds a large aft lazarette, adding even more storage to this beautiful cruiser. 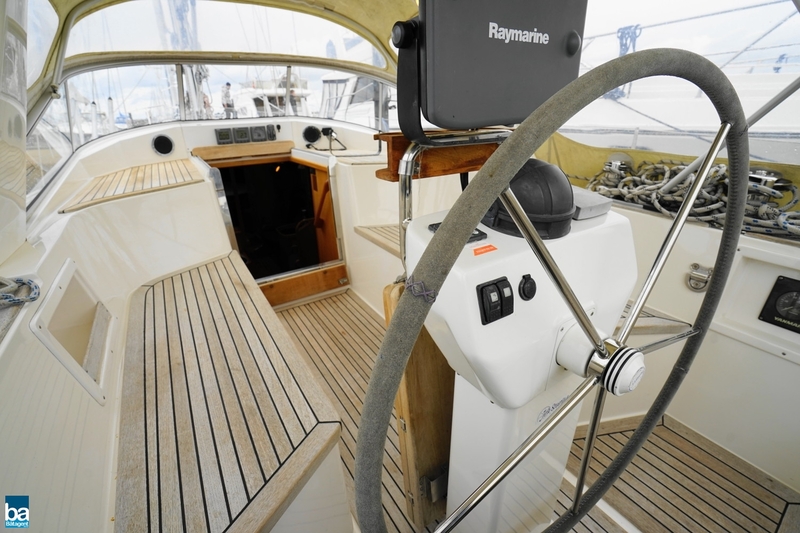 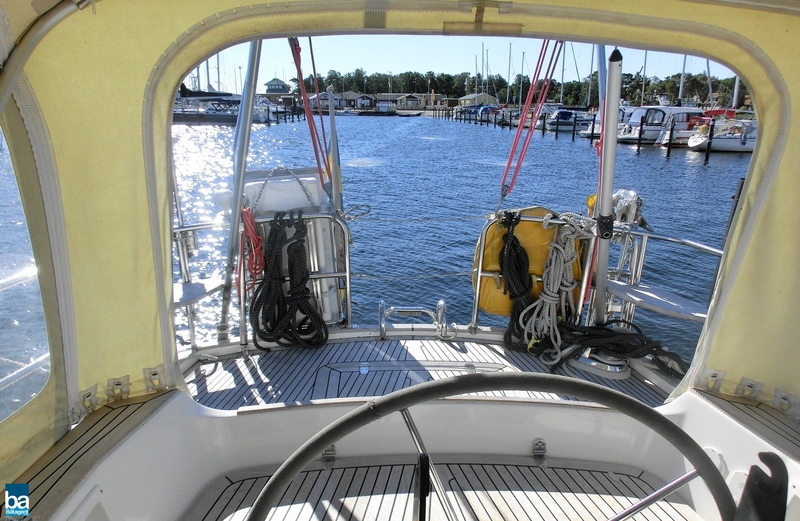 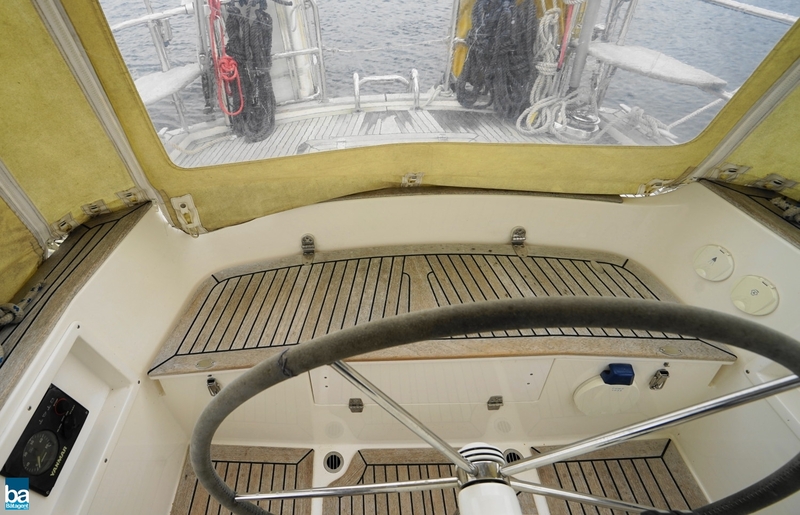 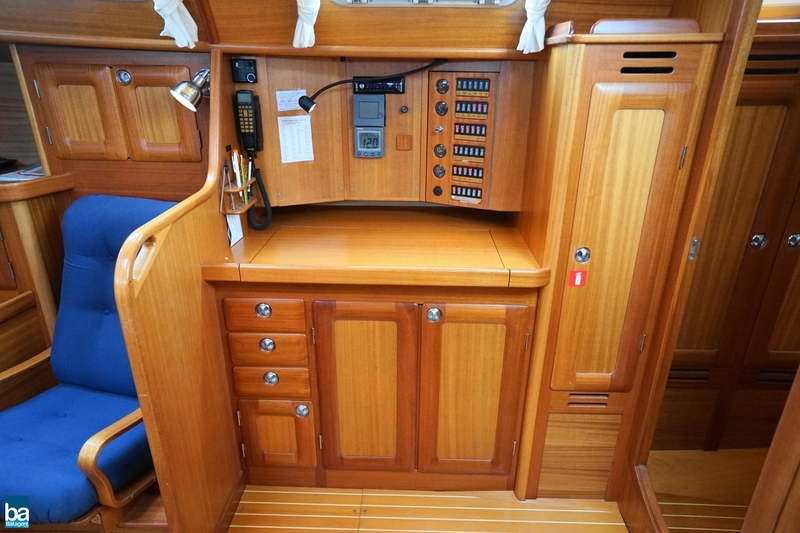 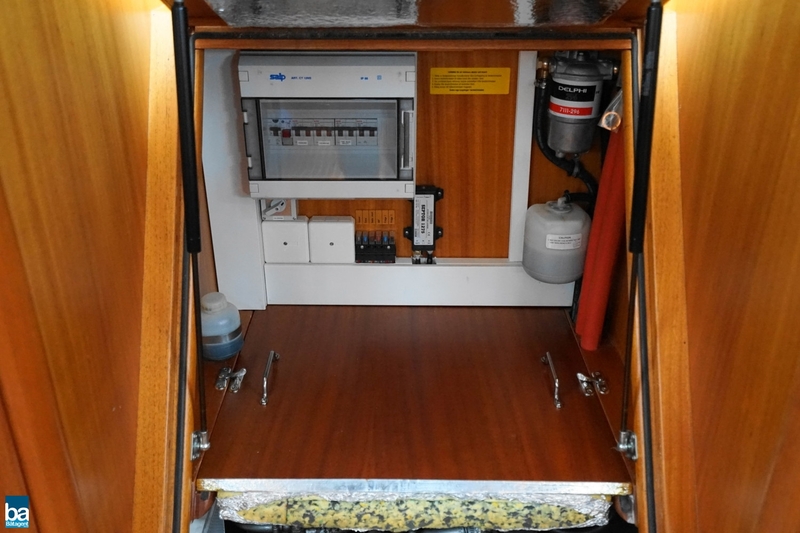 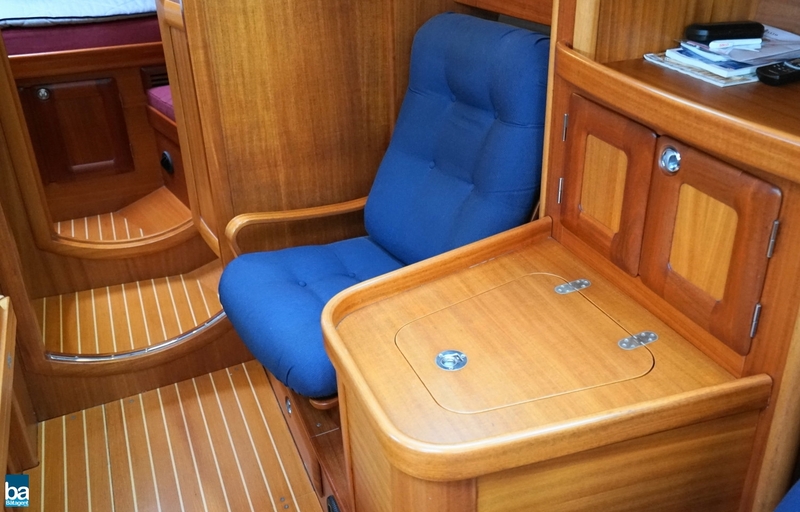 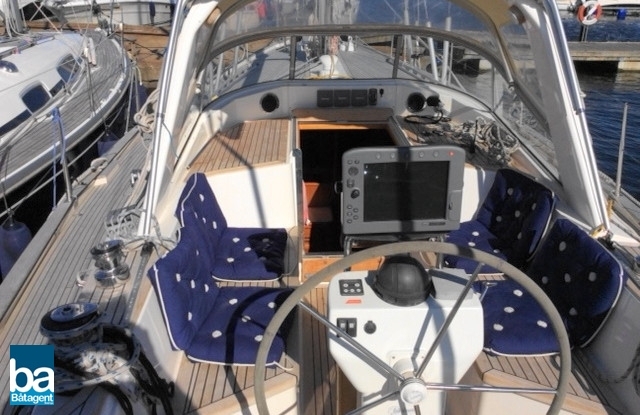 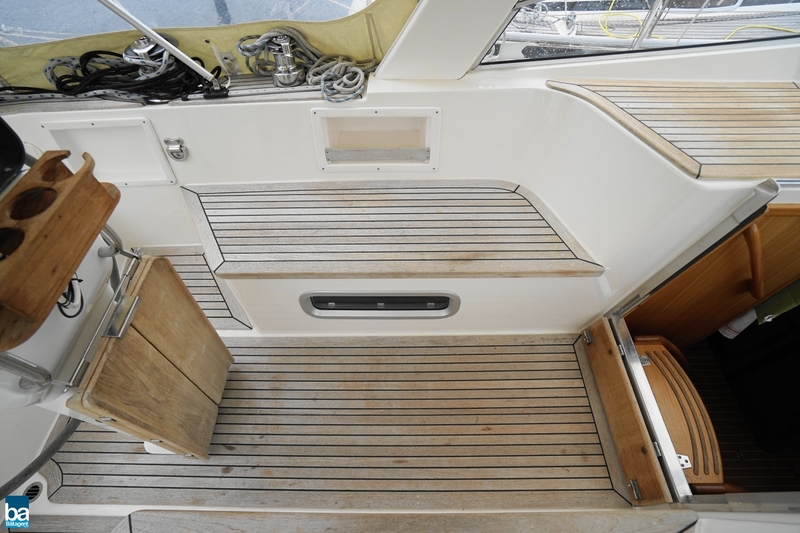 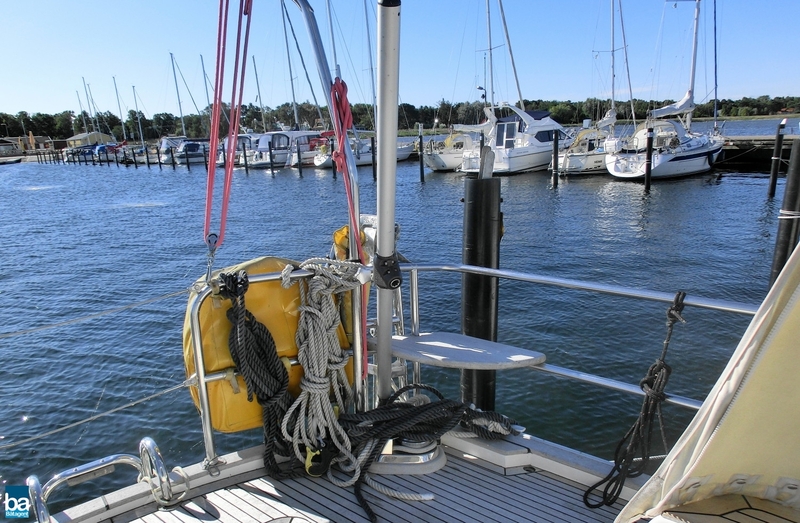 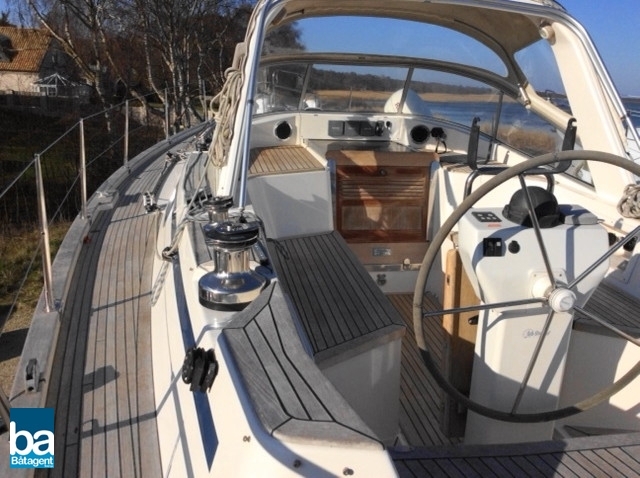 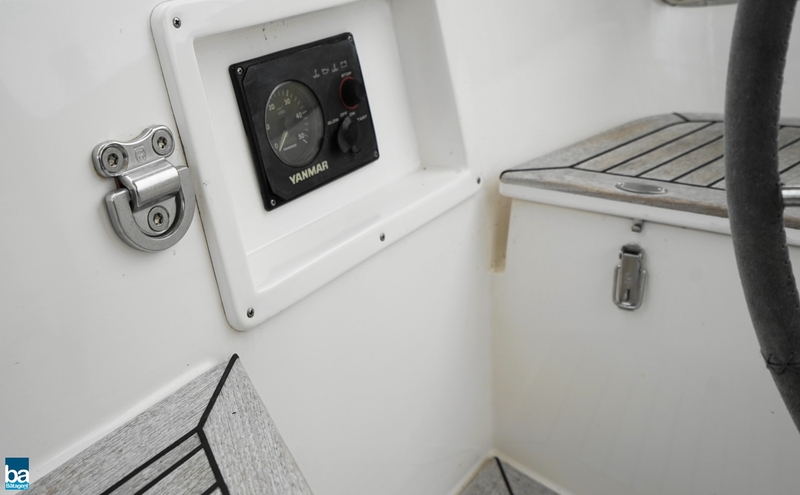 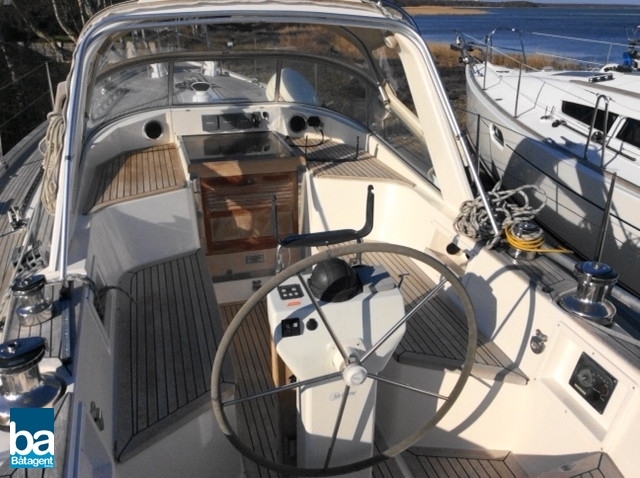 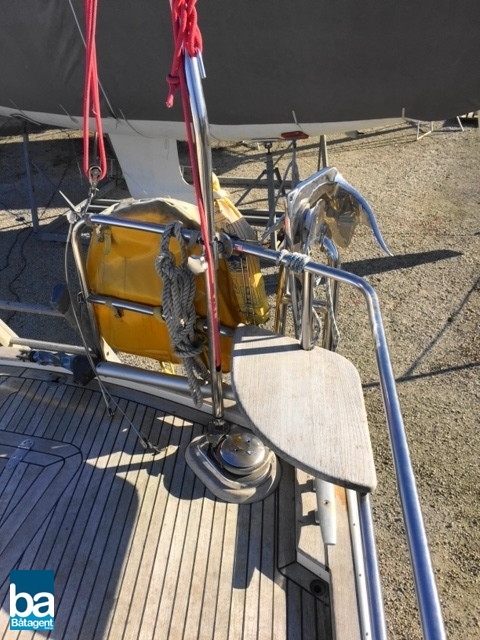 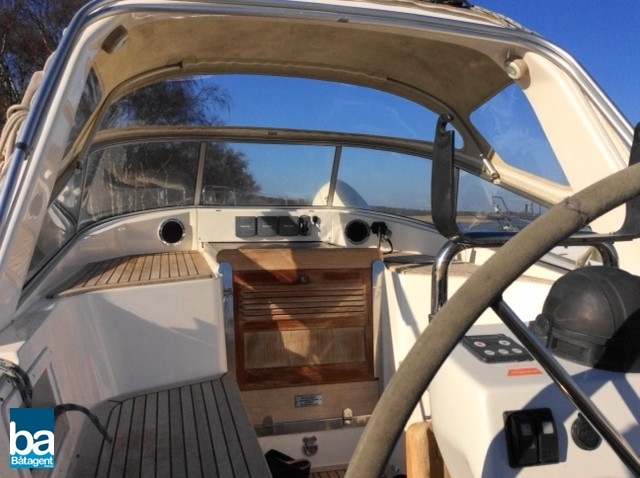 In many ways this gives you the best of both an aft-cockpit boat, with its larger cockpit that is placed lower in the boat, thus more protected and the aft deck typically associated with a center-cockpit boat. 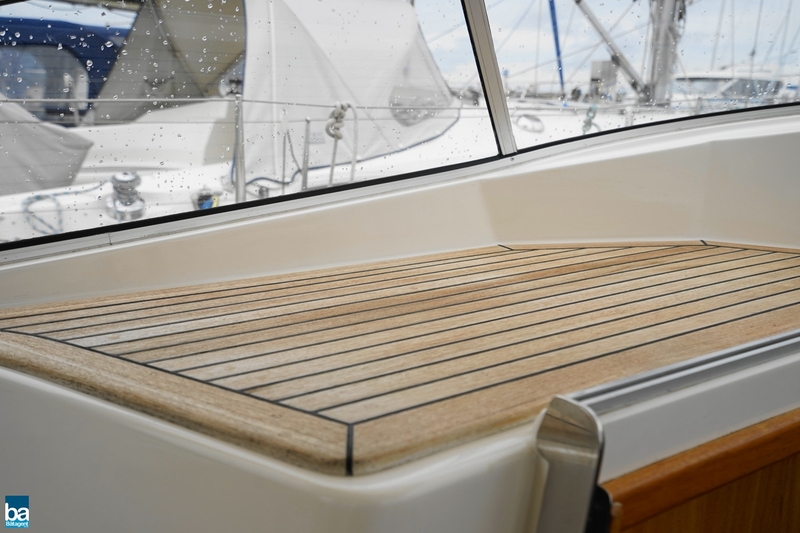 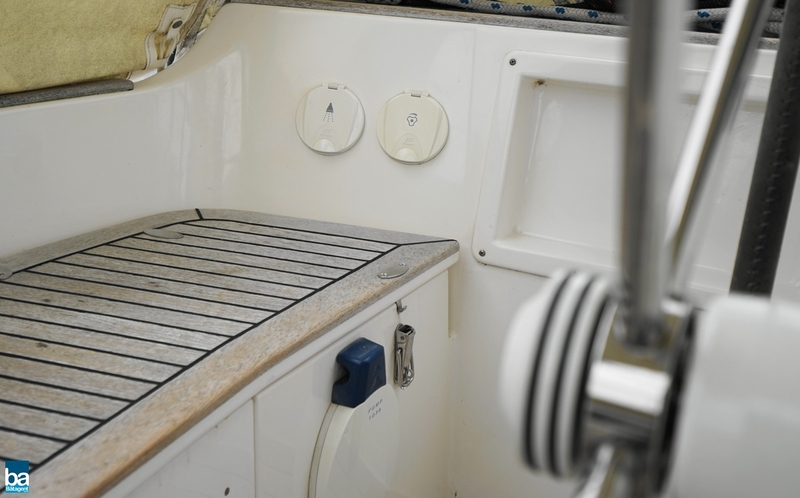 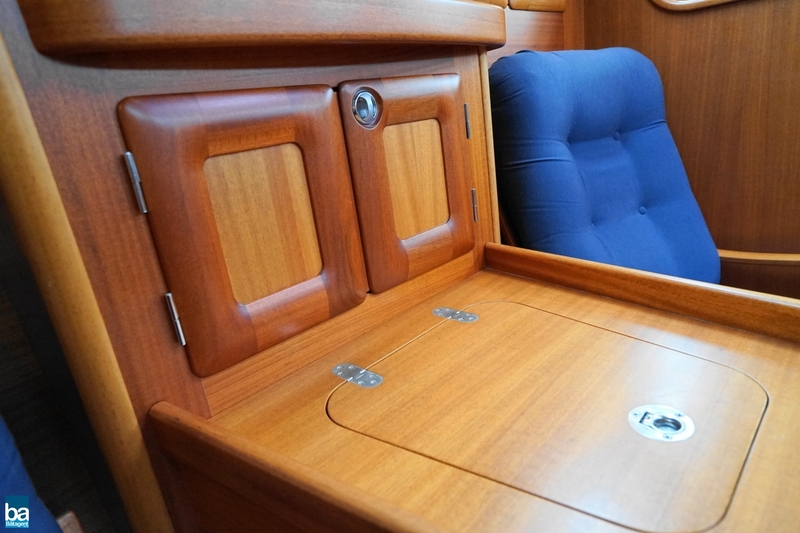 The addition of the aft-deck to the already wide and secure deck-areas throughout this boat, adds to the comfort and security when on deck. 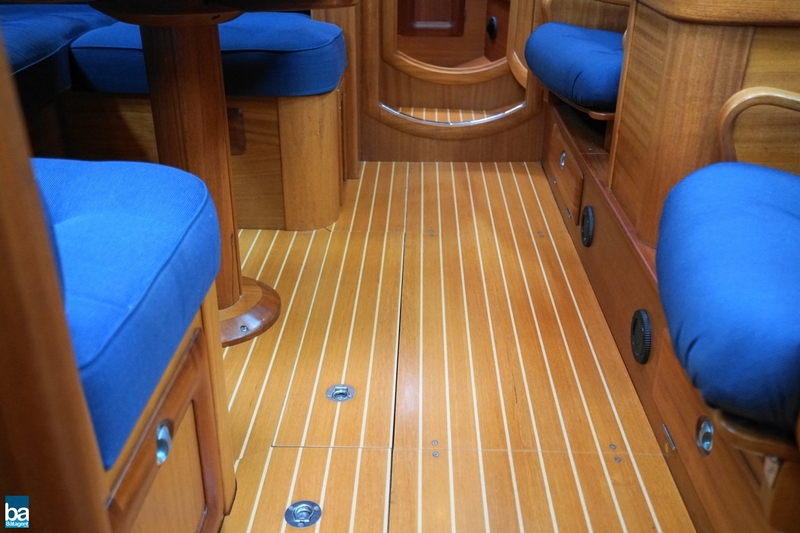 The wide and secure decks are laid with teak in the Orust-tradition, both beautiful to the eye and providing secure footing. 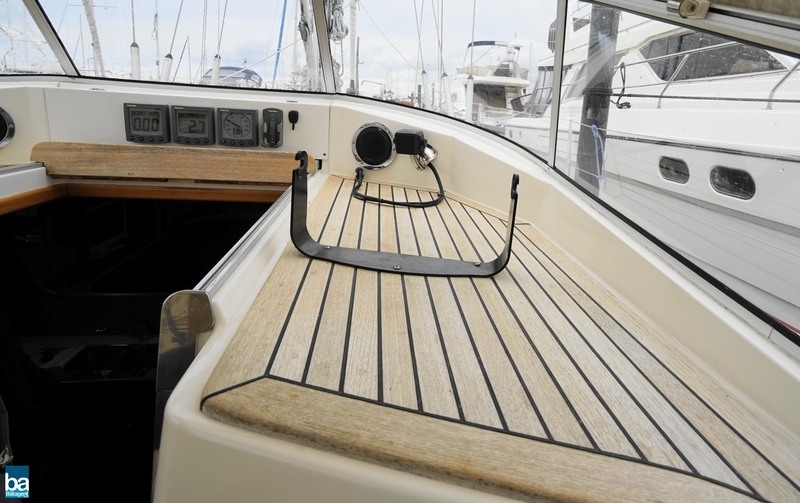 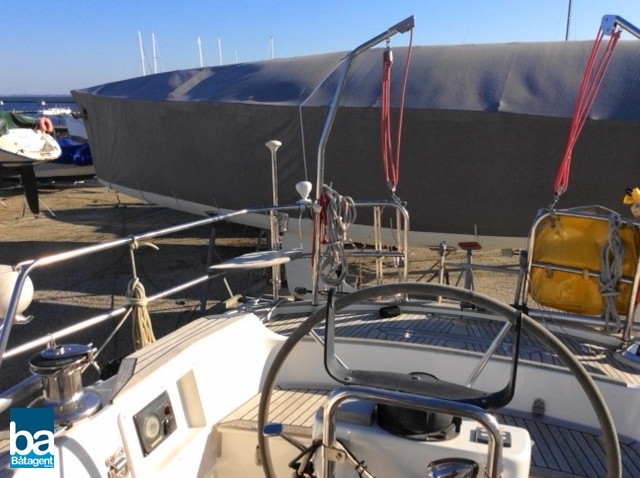 The cockpit has the by now legendary targa-arch, providing a secure and mechanically clever solution for the main-sheet, while at the same time providing a solid support for both the spray-hood and the cockpit-tent. 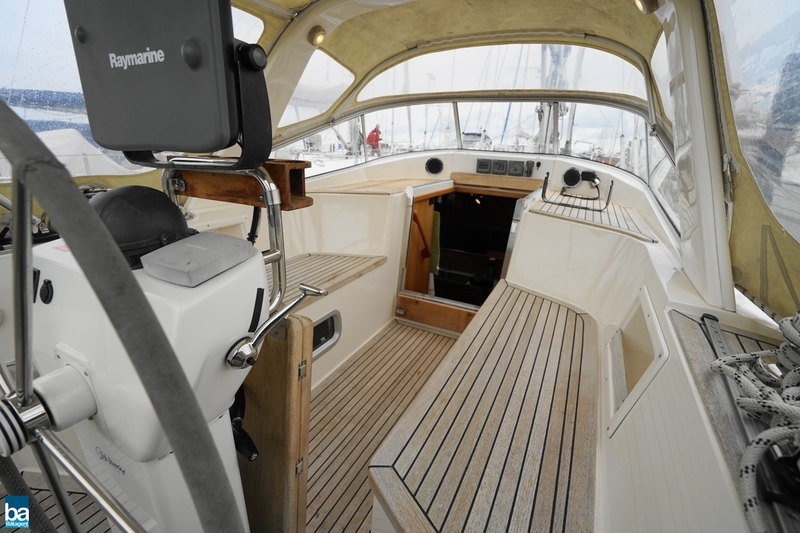 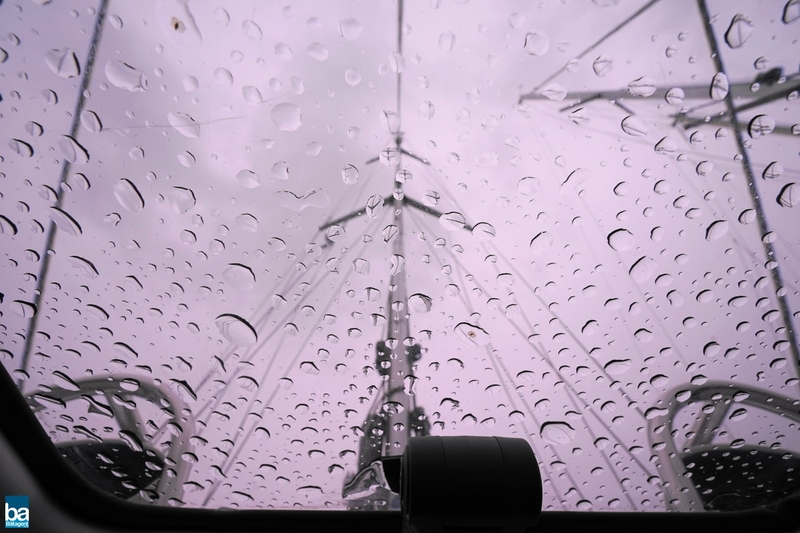 With this arrangement, the cockpit can really be used in any weather without negatively impacting the feeling a space as well as the 360 degree surrounding view. 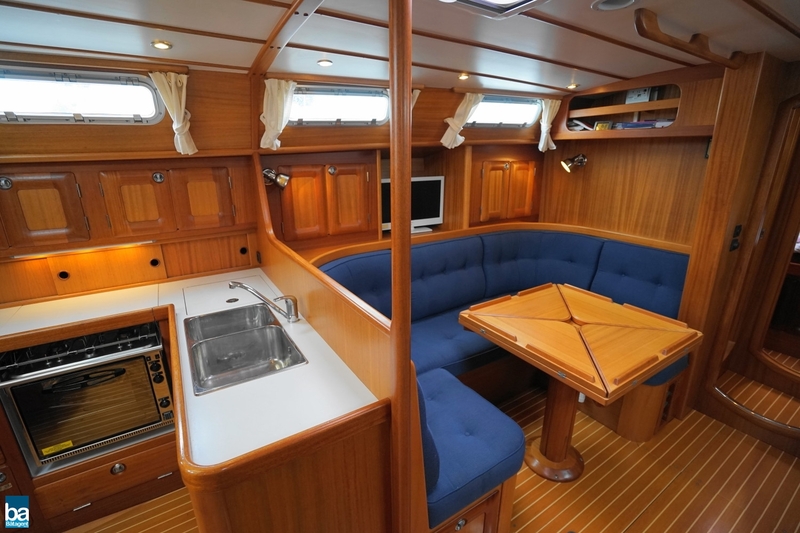 This Malö 40 has the desirable extra of having the three cabin layout, providing superb flexibility for the larger family, for entertaining guest, or any combination thereof. 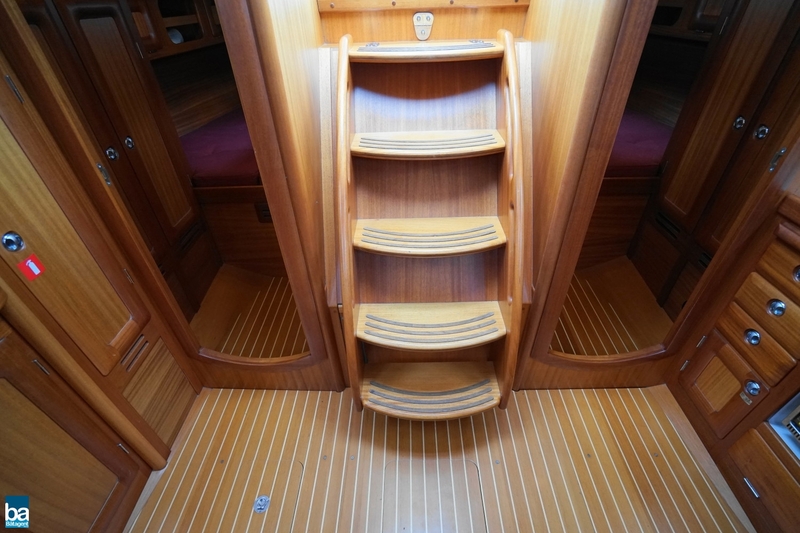 As always on a Malö, the woodwork is of the utmost quality. 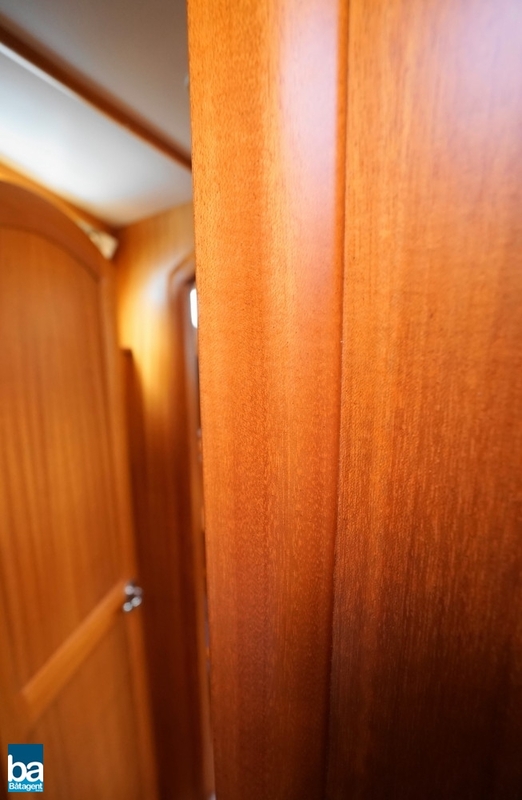 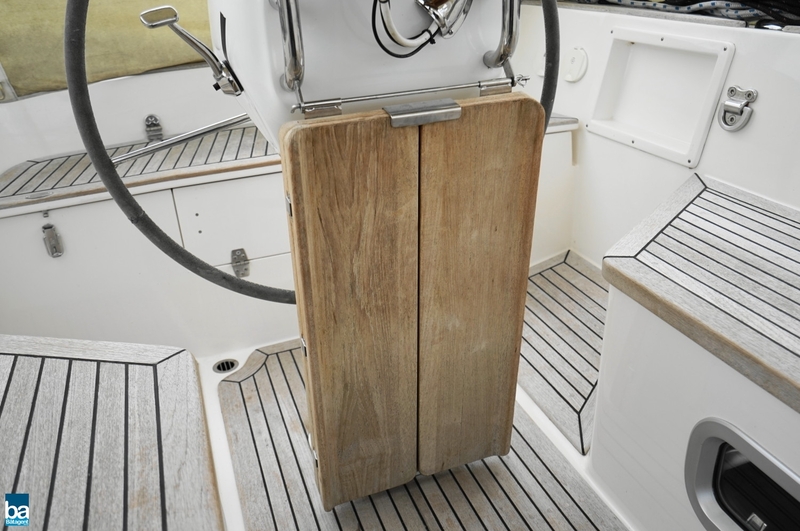 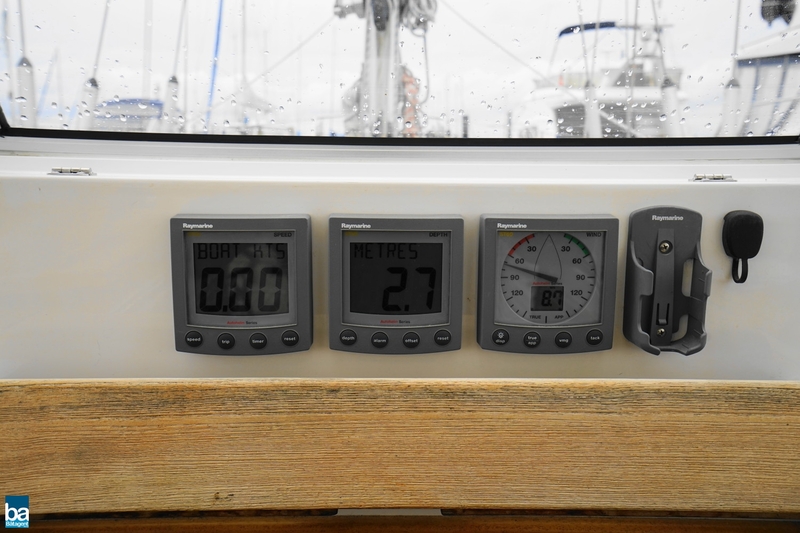 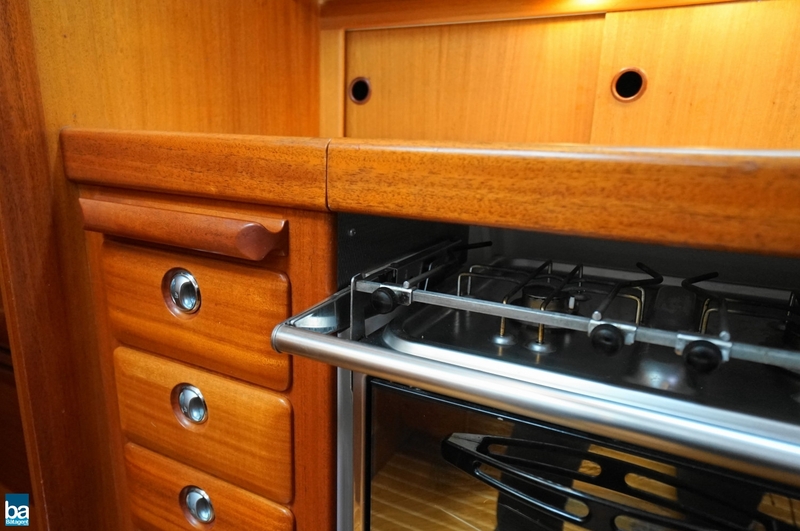 The tactile feeling of touching handles and grabrails alone makes you never want to go ashore. 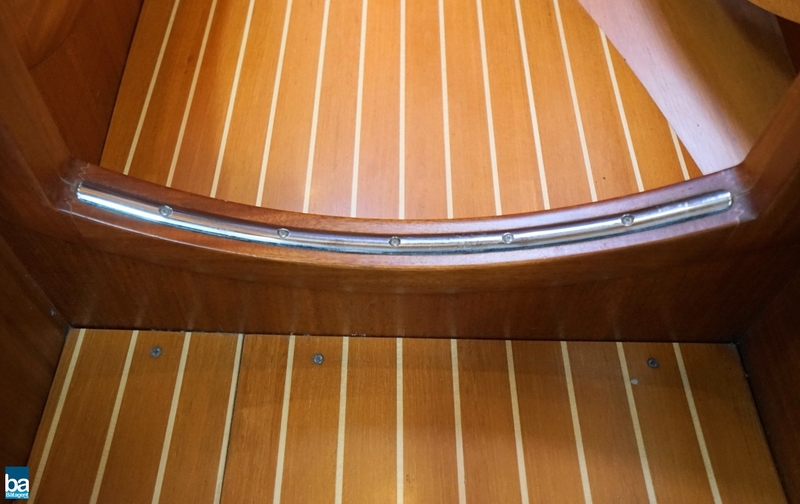 Absulutely no short-cuts or rationalising steps in order to cut corners or save time have been used, this is the art of boat-building of the higherst dregree. 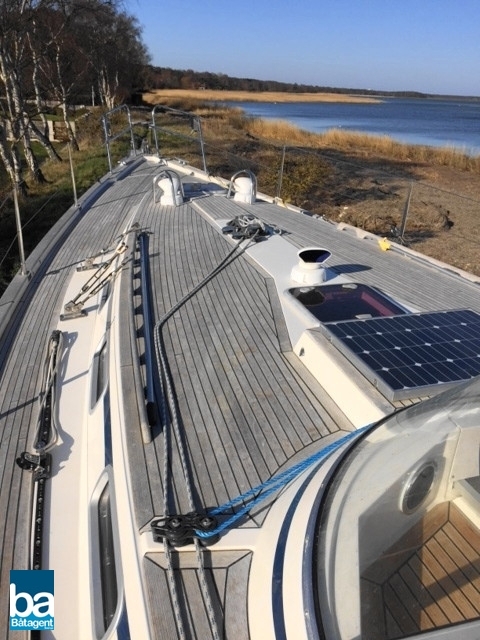 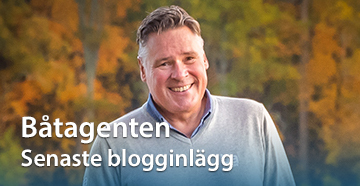 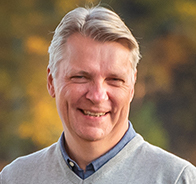 Tied and tested solutions everywhere, coupled with the best suppliers of equipment found by Malö, adds to both the pride of ownershipp as well as the feeling of comfort and safety aboard a Malö. 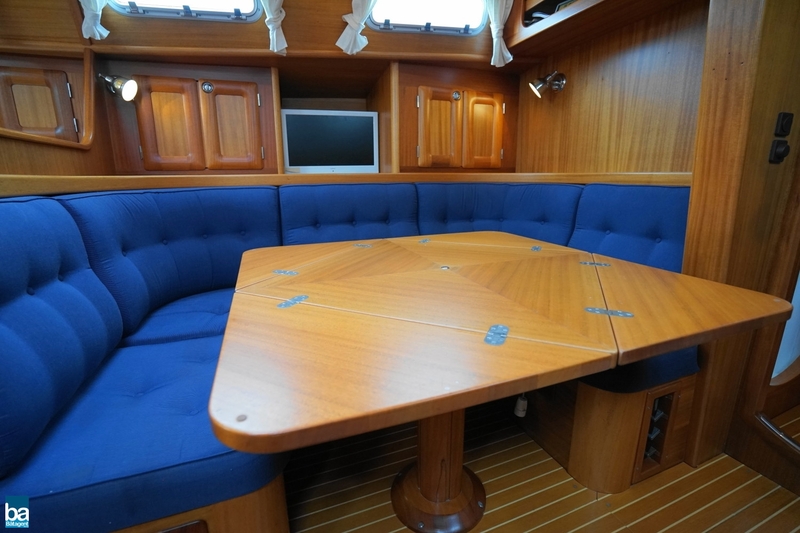 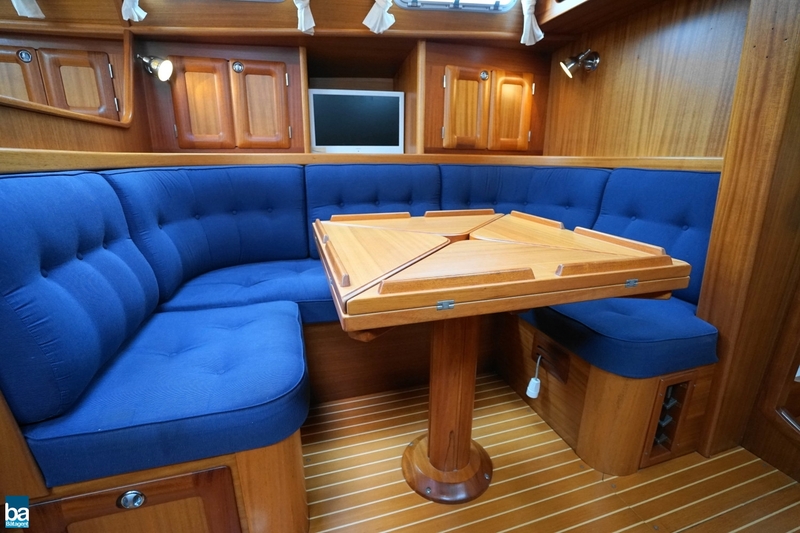 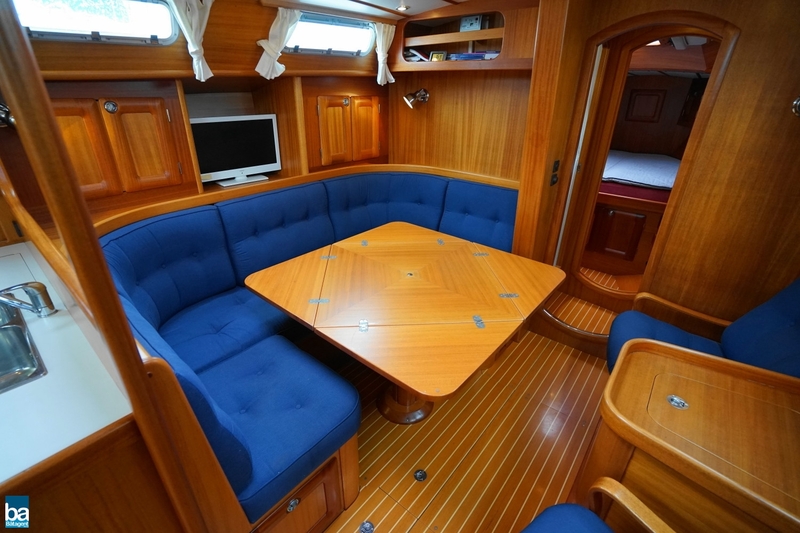 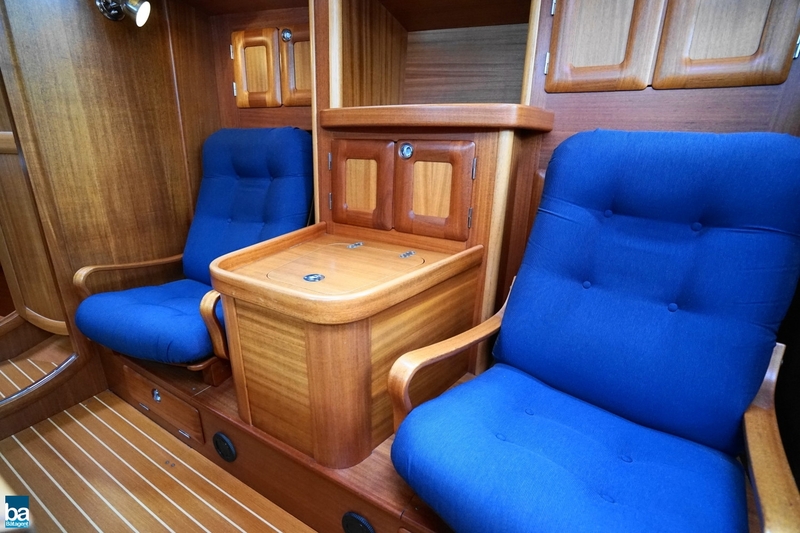 The main saloon is very spacious, with a flexible seating and eating arrangement to port, and the luxurious arrangement with double arm-chairs to starboard. 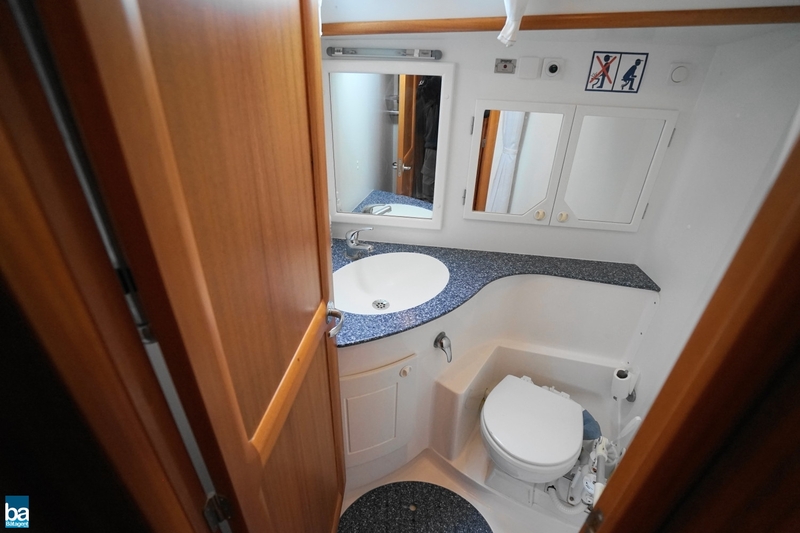 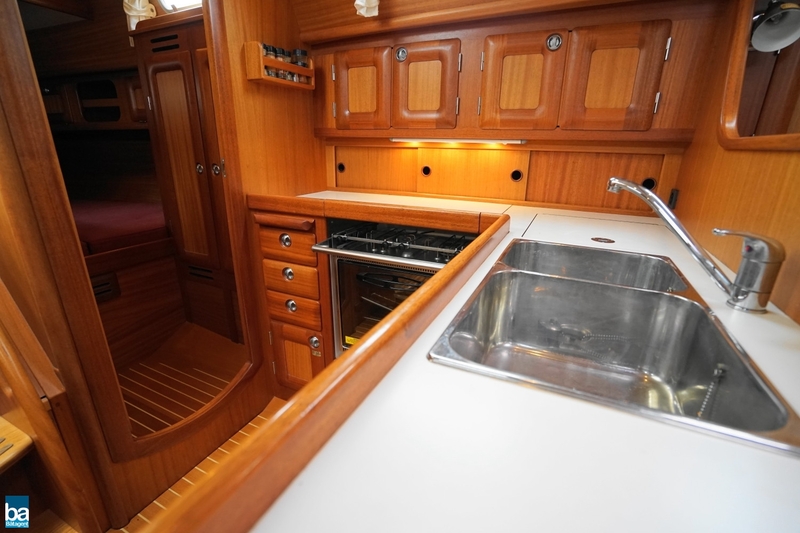 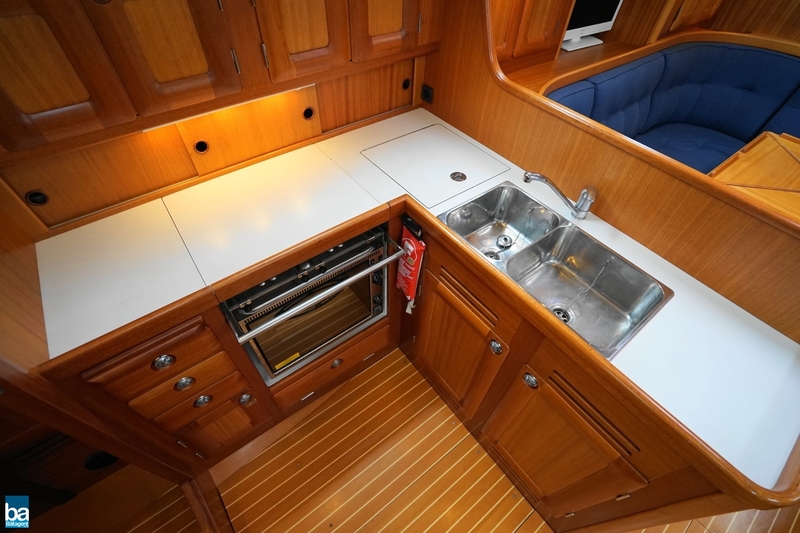 In line with the rest of the boat, the galley is both spacious and practical. 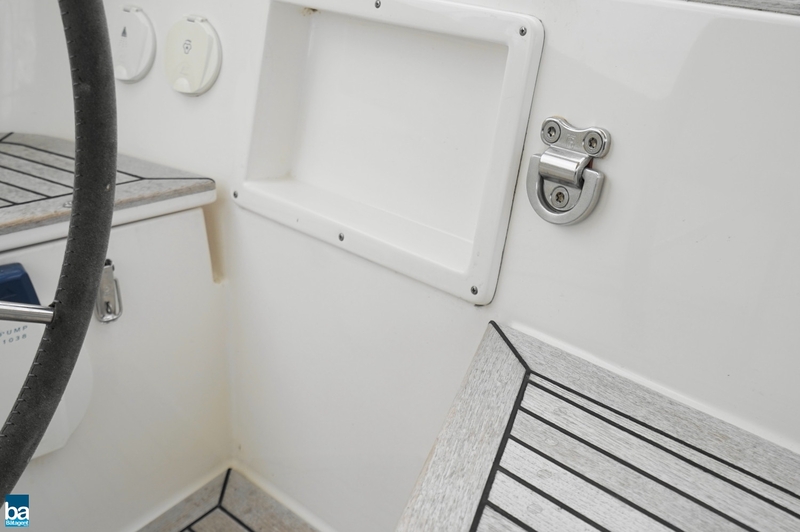 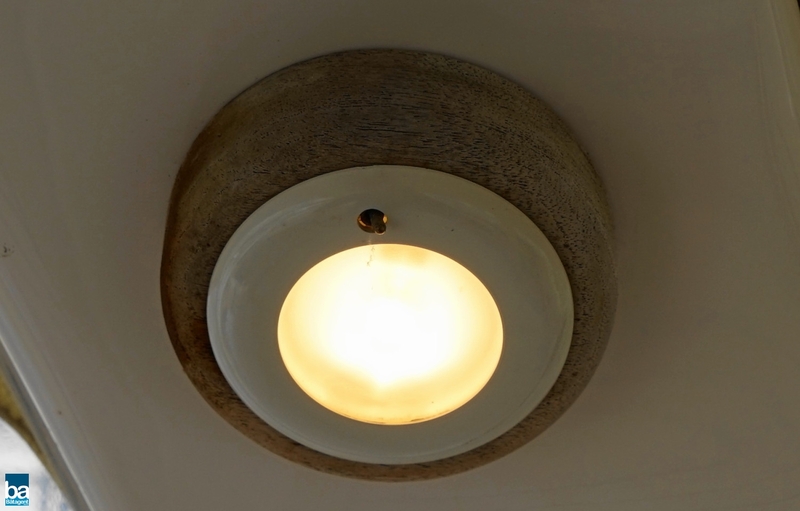 The bathroom and heads is also designed with the best material, ensuring both beauty and practicality. 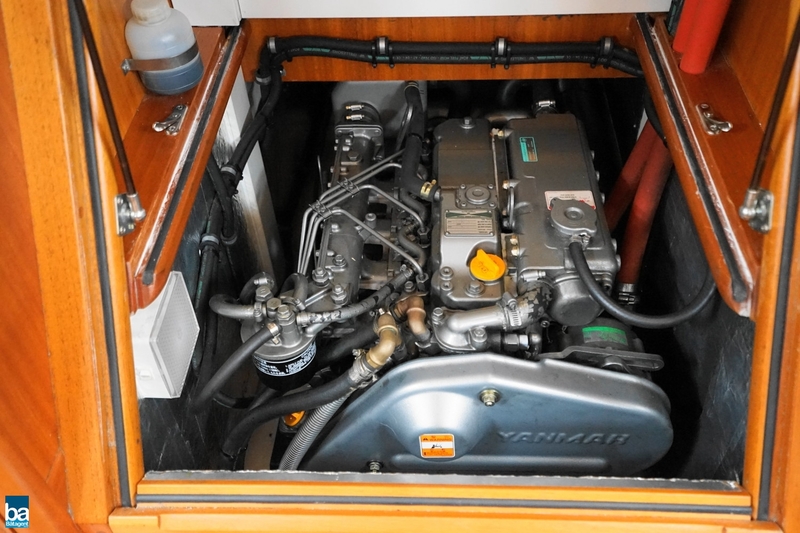 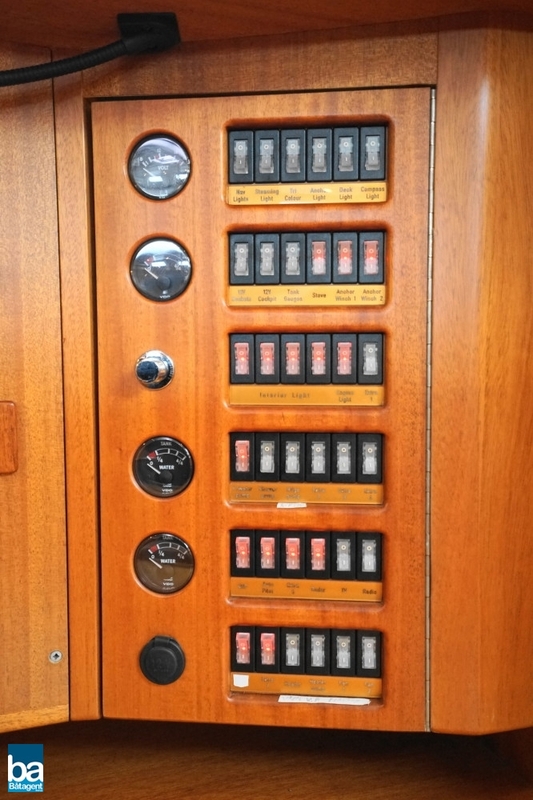 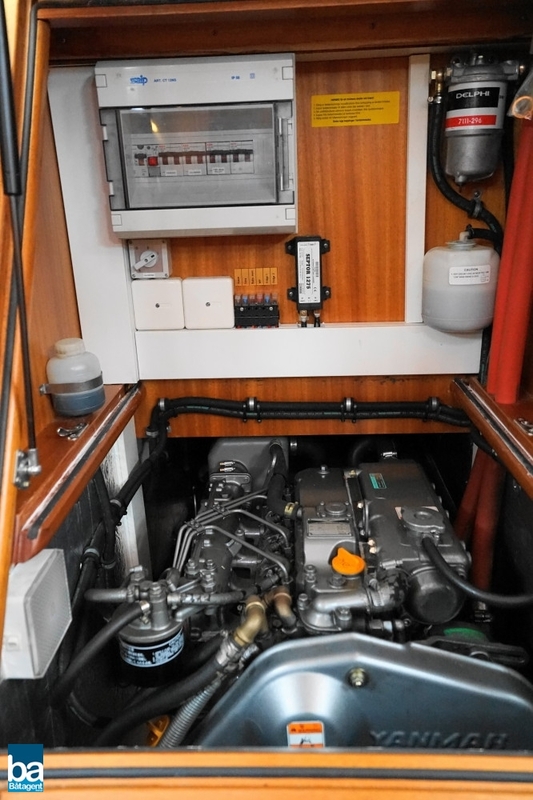 There is an electric windlass both in the bow and in the stern, a strong grey engine from Yanmar, beautiful winches for Andersen etc, the lsit goes on and on. 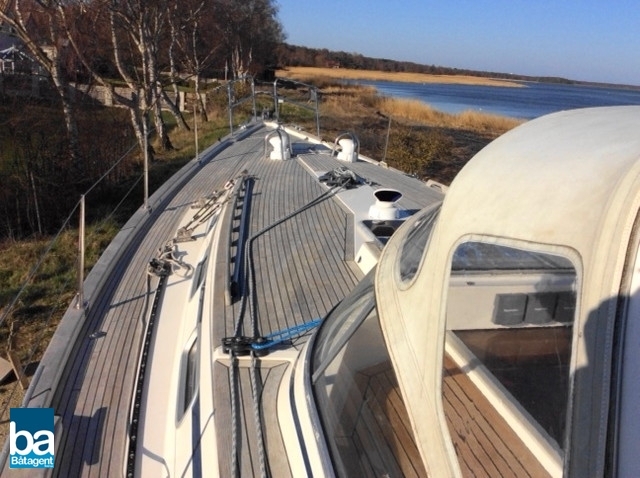 A through and through excellent yacht!